HOME-OWNERS in the NEPEAN & Blue Mountains region, who find signs of termite activity inside their home have several options for professional protection from continued termite infestation and timber damage in the building. Initial Inspection & Report to A.S.3660 - involve the thorough inspection of all buildings and surrounds - a detailed written report to Australian Standard 3660 - covering areas inspected - evidence found of termite activity - disclosure possible termite entry areas inaccessible to inspection - termite control options and limitations. Chemical Soil Treatment around the perimeter and sub-floor of a building - designed to eradicate termites attempting to gain entry into the building - sometimes a complete barrier not practicable depending on the construction layout of the building - the best long term protection option in vast majority of situations - Termidor or Premise termiticides are recommended. Termite Baiting - installation and monitoring of termite bait stations - Nemesis termite baits. This method relies heavily on the termites "finding" and consuming sufficient bait. Recommended in some limited circumstances, particularly to areas where live termites are found. Building Modification & Maintenance - termite risk reduction measures - may include improving subfloor ventilation - removal of timber in contact with the soil - improving inspection access areas. Subsequent Inspections to A.S.3660 - essential - at least at 3 to 6 months intervals where signs of termite activity has been previously located close by susceptible buildings or timber structures. It is essential first and foremost to obtain thorough inspection of the buildings and surrounds, and obtain a written inspection report and detailed specifications to A.S.3660 for an integrated termite control program. It is essential that the inspection and report be received and considered in detail before any protective measures are commenced. The cost - a professional termite inspection and report to A.S.3660 will cost around $200 to $300 for an average size residential building, depending upon style of construction and ease of inspection access. Specific areas inspected should include all accessible timbers within the crawl space in the sub-floor, roof void, interior, exterior, garden landscaping, fences, other timber structures and trees in the locality. Your home insurance will NOT cover termite damage to structural and decorative timbers inside a residential or commercial property, which could be severe. FUMAPEST has Professional indemnity insurance to cover future termite damage to structural and decorative timbers in a building after we have carried out a complete soil treatment service to AS 3660. Termites in the building at the time of chemical soil treatment cannot safely return to their central colony nest through the chemically treated soil. Termites usually return every few days to their central underground to obtain moisture essential for their survival and to feed and groom other termites. Termites sometimes nest inside a building - in a roof or wall cavity where moisture is regularly supplied - such as from a faulty plumbing, leaking shower recess, broken roof tiles and faulty guttering. Termite control chemicals are required to be assessed and approved by the Federal Govt agency APVMA - for example - soil treatment termiticides - Termidor - Premise - Biflex and termite baits - Nemises - Exterra - Sentricon. Solvent based termiticides are NOT used by FUMAPEST as such products may cause immediate health problems for people with asthmatic or bronchial ailments. Water based - Termidor and Premise are the safer effective alternatives. Both are water based, have virtually no smell and of ultra-low hazard to humans, dogs, cats and other mammals. Termidor termiticide is manufactured by BASF, and Premise termiticide by Bayer two of the world's most respected chemical companies. Termidor and Premise do NOT have an obnoxious odour or emit airborne residues or fumes. Both are registered as a low hazard insecticide with a CAUTION notation on the registered label. Fipronil is the active ingredient in Termidor. Fipronil is also in the Frontline flea and tick control product used on millions of cats and dogs in Australia and the USA. Termidor and Premise represent modern technology and are NOT in the older style organo-chlorine or organo-phosphate pesticide group. Avoid repellency products: Some alternative termiticides have a strong repellency action to deter foraging termites. Repellant products are less effective in that the termites can detect the chemical and avoid it and move along the treated soil areas, actively seeking a gap to gain entry into the building. Non-repellant products, such as Termidor and Premise are more effective, in that the termites cannot avoid what they cannot detect. 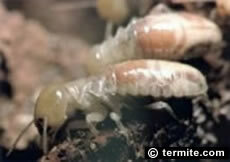 The chemical adheres to the skin of the worker termites or they ingest it when tunneling through treated soil areas. These products have a delayed lethal effect - enough time to be taken back to the colony nest and be spread to other termites during their mutual feeding and grooming. With sufficient consumption of the chemical, the entire colony is eliminated. Premise has been used as soil treatment against subterranean termites for more than ten years in Australia and the USA with excellent results for long term termite control. FUMAPEST is not aware of any significant problems with the effectiveness of Premise termiticide during this period. Premise will act to kill termites, in the higher concentration treated soil areas abutting the building. With Premise, termites that forage in the lower concentrated treated soil areas, will become disorientated, stop feeding, and are fatally diseased by natural fungi and micro-organisms in the soil. Termites tunneling in the Premise or Termidor treated soil area abutting the building (of high concentration - near the point of application) are killed outright. Termites tunneling in the outer parts of a Premise or Termidor treated soil area (of low concentration) will not detect the chemical which adheres to their bodies and has a delayed lethal effect of several days - enough time to be transferred back to the central colony nest. Worker termites have a very thin waxy skin (called an exoskeleton) that readily absorbs moisture. Both Premise and Termidor adheres to the termite exoskeleton and is readily adsorbed through the exoskeleton and into the termite's body to immobilize and kill the affected termite within a few days. In that time, the termites spread the Premise or Termidor chemical to other termites during regular physical contact, particularly when working together in close proximity, grooming and feeding the rest of the colony, a regular function of their daily life. Cannibals by nature: Termites carry away or cannibalize other dead termites, further spreading the lethal effect of the Premise or Termidor chemical throughout the colony. Termite baits registered in Australia by the Australian Federal Government APVMA Registration Authority are Nemesis, Exterra and Sentricon brand of termite baits. We recommend Nemesis termite baits which is the latest tested and approved product used in Australia. Exterra and Sentricon are USA owned termite bait products. A number of plastic bait stations for in-ground and above-ground installation where active termites have been located are installed. How a Nemesis termite bait works: Each termite bait contains an IGR chemical - that is an insect growth regulator - the Nemesis bait contains chlorfluazuron as the active constituent. The worker termites readily eat the bait and pass it onto other termites in the central nest as part of their mutual feeding and grooming process. Termites must regularly molt in their development from nymph to adult. The IGR is slow acting - enough time to spread it's deady effect to other termites in the colony. Termites have acute survival instincts. The location of a toxic food source if detected, will be abandoned. Too much disturbance of the foraging termites (workers and soldiers) in a particular location, will alert the termite colony to abandon the area. The termites appear to be gone, but may in fact be entering the building in other areas. Your home is a much bigger bait station. Regular monitoring is required: The Nemesis termite baiting system is subject to regular inspection and monitoring by the termite controller. The larger the number of termites that consume the bait, the quicker and more certain is the termite colony elimination process. Baiting is sometimes unreliable: Termite colony elimination in favourable circumstances may take several weeks to a few months. However, in some cases, termite colony elimination is unsuccessful or may take years, depending on the circumstances. It depends if a large number of termites find and consume the bait, then colony elimination is virtually assured within a few months. The experience and skill of the pest controller is paramount, in order to properly decide if and where a baiting program is to be implemented and properly monitored. WARNING: some pest controllers offer termite baiting at ridiculously low prices that does not cover direct materials and labour. BEWARE the pest control licensing system in NSW is inadequate. Some individuals have a NSW Govt WorCover pest control licence with little training or experience. Consumer note: It is usual to reinspect the bait stations and the buildings and surrounds every month to reposition, reapply or replenish the bait, if necessary. This process is labour intensive so that the long term cost of the monitoring and baiting system may accumulate out of hand before the chance of success or otherwise, is realised. Ring the Experts: successful termite protection of a building using a baiting program often requires expert skill and judgment, based upon many years of field-work experience in a wide variety of circumstances. FUMAPEST has been providing professional termite control services in the NEPEAN & Blue Mountains region for more than 50 years, with a very high success rate for complete termite protection. Live termites found? One critical aspect is the bait stations should to installed in areas where live activity is found. Otherwise the termites must blindly "find" the stations to have any chance of bait consumption and successful elimination. CONSUMER NOTICE: Be wary of companies want full payment upfront that promise a timber replacement warranty using a termite baiting and monitoring system. Be careful to read the Contract fine print which stipulates that the so called "warranty" may or may NOT apply at some future point in time when the company decides at it's descretion that the termite colony elimination is successful. No absolute guarantee: With a termite baiting program, there can be no absolute guarantee of long-term protection of nearby buildings. There may be other termite nests nearby the building that do not find the bait stations. Your home is a much bigger bait station. Other termite nests may exist in trees, under concrete on-ground flooring and in-fill patios of neighboring properties. These termite nest may be unaffected by the baiting program.. If termites happen to 'find" the in-ground "monitoring" stations, then a bait is placed therein. If this involves sufficient disruption of the termites may avoid the in-ground bait station, entirely. RECOMMENDATION: FUMAPEST apply the Nemesis Termite Bait directly onto known termite activity areas. The rate and amount of consumption is monitored for several weeks. In addition, if practicable thereafter, a complete chemical soil barrier treatment using Termidor or Premise be applied around the immediate perimeter of the building and other high risk entry points. AN INTEGRATED APPROACH: A termite monitoring and baiting program can be integrated with a range of methods including (1) drilling susceptible trees and eradication of any termite nest located therein, and (2) in conjunction with a follow up chemical soil treatment using Termidor or Premise. (1) Moisture exclusion from inside the wall cavities, around the base of the building and sub-floor area. Exclude excessive water run-off from a sub-floor area by the installation of ag-drains. Make sure there is adequate cross flow ventilation in the sub-floor area. In addition, a qualified plumber should be engaged to ensure there is no water leakage from plumbing pipes in the bathroom, the shower recess, kitchen, down pipes, guttering and air conditioning unit overflow. Look for signs of dampness in the wall cavities, broken roof tiles, faulty guttering and the like. Please note: high humidity, dampness or moisture accumulating in a wall cavity is of high risk to encouraging large scale termite activity inside the building. If you find live termites DO NOT disturb the area. DO NOT use spray insecticides on the termites. If sufficiently disturbed, the termites may move elsewhere and not be rediscovered until severe damage has been done. The termite controller can install a termite bait on the termite activity area aimed at maximising bait consumption by the termites and elimination of the entire colony. AS.3660 Requires Follow-up Inspections after the installation of a chemical soil barrier to AS.3660 be carried out at least 6 monthly intervals where the termite risk is high. FUMAPEST Policy is usually to recommend 6 or 12 monthly inspections be carried for the first 24 months following a chemical soil treatment. If all seems OK then annually thereafter. A Word of Warning: the correct identification of a destructive termite species, inspection of a building for tell-tale signs, analysis of your circumstances and the design and implementation of an effective program for the protection of a building from termite infestations, requires expert skill and judgment based upon professional training and extensive field-work experience in termite control in a wide variety of circumstances. Same Family Business Since 1964 • FUMAPEST is a second generation family business. After more than 50 years of providing pest control in the NEPEAN & Blue Mountains region, we have a valuable reputation in the marketplace and have acquired a wealth of knowledge and experience, unmatched by our competitors. APCA Consumer Advice • FUMAPEST Termite & Pest Control is a major sponsor of the Australian Pest Control Association; assists APCA Secretariat in the provision of professional advice to consumers with pest control problems; pesticide safety issues and pest control training courses available in NSW..
Industry Stewardship FUMAPEST Managing Director served as a Member of NSW Govt Pest Control Licensing Board for 8 years and Standards Australia Termite Control Committees on Termite Control AS3660 & Termite Inspection Reports AS4349. Commercial Food Handling Premises • FUMAPEST is Penrith Council Food Act & HACCP compliant • commercial food handling premises • restaurants • cafes • hotels • motels • hospitals • child care centres • nursing homes • retirement villages • churches • schools • colleges• universities • race-horse stables • veterinary clinics and other sensitive environments. Setting the Standard in an industry many fly-by-night operators, FUMAPEST Pest Control stands out as a well established pest control business with an excellent reputation in the market-place in the NEPEAN & Blue Mountains region.